Trainer Tony Gollan says Ef Troop could be a potential Group 1 Coolmore Stud Stakes prospect if he delivers down the straight at Flemington on Saturday. Ef Troop impressed in a recent trial at Rosehill and Gollan has high hopes heading into the Group 2 Danehill Stakes, which is often a good benchmark for those horses with Coolmore Stud Stakes potential. Top jockey Damien Oliver will be in the saddle, and Gollan says Ef Troop should enjoy the Flemington straight just like his uncle Temple Of Boom did. "My gut feeling is Ef Troop will handle the Flemington straight and if he performs really well in the Danehill we would probably be looking towards the Coolmore," Gollan said. 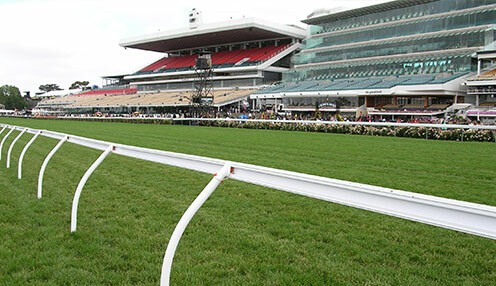 "The Danehill is the only straight race for three-year-olds prior to the Coolmore that gives your horse an opportunity to have a look at the straight six at Flemington. "Ef Troop's father Spirit Of Boom and also Temple of Boom ran up the straight a lot of times over six furlongs, so hopefully he can handle the straight as good as his father and his uncle." If Ef Troop does not perform as well as Gollan hopes, he says there is the option for a freshen-up before heading towards the Gold Coast Magic Millions carnival in January. My gut feeling is Ef Troop will handle the Flemington straight and if he performs really well in the Danehill we would probably be looking towards the Coolmore. "He is a bigger, stronger, better model than what he was at two," Gollan added. "He is an impressive horse but he would want to be as the Danehill is definitely going to be a good race. "I'm really happy to have Damien Oliver riding him - he was one of four or five Victorian riders we approached and he got back to us quickly so we locked him in early. "There are several options for Ef Troop after the Danehill, it all just depends on how he handles the straight." Ef Troop is 14/1 to win the Danehill, while Pure Elation is priced at 11/4 and Smart Melody is 3/1.